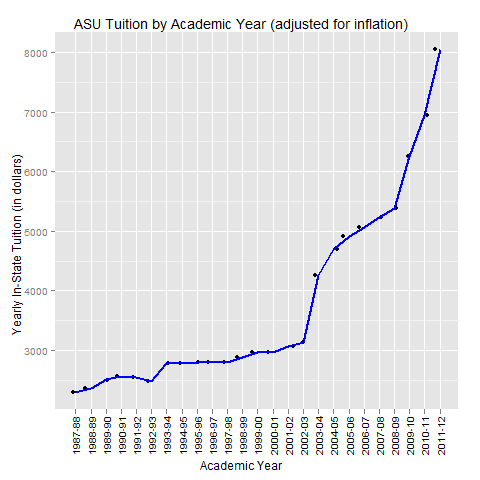 Arizona State University tuition fees from 1987-2011. It has been suggested that the 'cost' of tuition has remained the same throughout the years, yet the 'price' of tuition to the students has increased. In other words, since the Arizona Board of Regents has slashed the amount of funding given to ASU, and the 'cost' of educating a student remains the same, it is now up to the student to make up the difference. To what program is this money now going? Looking at the graph, it seems like education will be beyond the reach of many students within just a few years - when will this trend stop? What alternatives exist for a quality education? Great analytical data on ASU tuition by academic year! As a mother, I have impressed to see the graph here on this post. I appreciate this type of analytics. Thank you so much and keep posting things like this. omg. when I attended the U of A from 1984 to 1991, the tuition started around 365 a semester and jumped to around 600-700 by 1991. I feel sorry for kids today. So expensive!